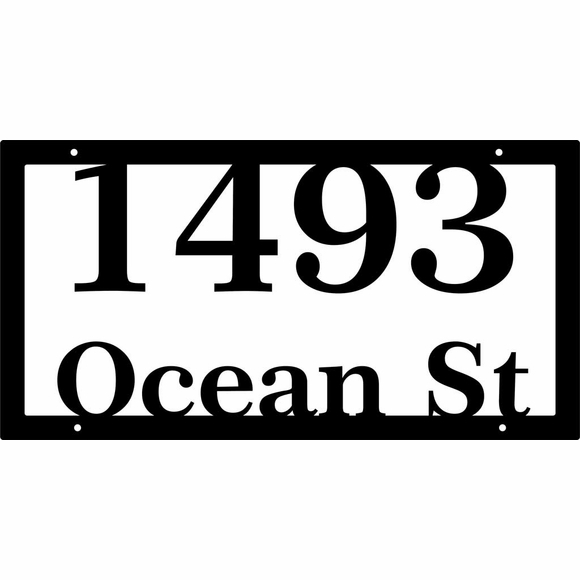 Silhouette 2 Line Address Sign - - frame and characters float in front of the wall, which functions as the second color. Made in USA exclusively for Comfort House. Custom made two-line, one-piece wall plaque. Upscale cut-out, silhouette letters and numbers seem to float in the air and are an impressive step above standard home or office signage. Manufactured in two sizes to fit almost any requirement. Small 15"W x 7.5"H sign holds up to four (4) 3.5" numbers on Line 1 and up to eight (8) 2" upper- and lower-case characters on Line 2. Large 20"W x 8.5"H sign holds up to six (6) 3.5" numbers on Line 1 and up to ten (10) 2" upper- and lower-case characters on Line 2. Base line (Line 2) can hold any type of street name, person�s name, company name, or whatever alternative wording you supply. For best visibility, choose a color that contrasts with the mounting wall. Comes complete with four mounting holes and stainless mounting screws. Unique one piece identification plaque holds two lines of floating characters. Made in USA exclusively for Comfort House.